I mean, August's only just begun, but I'm posting this in August, so...? Whatever. It's the August roundup! 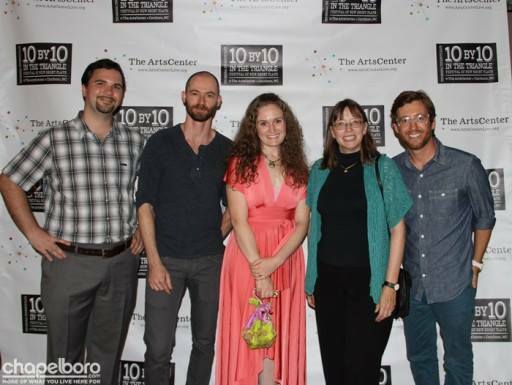 So many things: My girlfriend and I flew down to Carrboro, North Carolina (there's supposed to be a comma here but I've always hated that rule so screw it) last month to attend The ArtsCenter's 10 by 10 in the Triangle, where we got to meet some of the show's cast and crew as well as four of the other playwrights. The whole writing thing is a pretty solitary art, so it was great to compare notes with others who are up to similar shenanigans. Left to right: ME!, Corey Rieger, Bridget Erin, Elaine Smith, and Jordan Rawlins. While there, I saw my third production of Going Viral. I love all the different nuances each production brings. This one featured the first male "child" character (Jorge Donoso) and had a remix of David After the Dentist as the intro song. Great. And the parents (David Berberian and Page Purgar) were a riot. Two weeks later, I got to see a production of The Formative Years for the first time. It was part of the Artists' Exchange's 9th Annual One Act Play Festival, and they nailed it. The director, Jessica Bradley, added some great musical and physical business that really sold the fastidious, finicky world of these crazy people I created. Their total commitment to the insane wold of these "parents" made the piece even funnier than I could have hoped. Michael Shallcross and Meg Taylor-Roth. Please note the hand sanitizer on the bedstand. Heh. Then, this fall, Going Viral goes overseas to London for Playground: A New Writing Showcase, to Australia for Short+Sweet Queensland, and to Tasmania for Short+Sweet Hobart and the Deloraine One Act Festival. That last one will actually be the first festival I didn't have to submit to—the actors from Short+Sweet Hobart's production contacted me to ask if they could also do the show in Deloraine. It'll be two grandparents and their granddaughter, which certainly marks the first time that an actual family has performed Going Viral! Wish I could see it. And I think that's enough bragging for now. Here's my favorite thing on the internet or anywhere. August 10, 2014 by Brandon Crose.